I love simple. Who doesn’t, right? I actually love simple style. 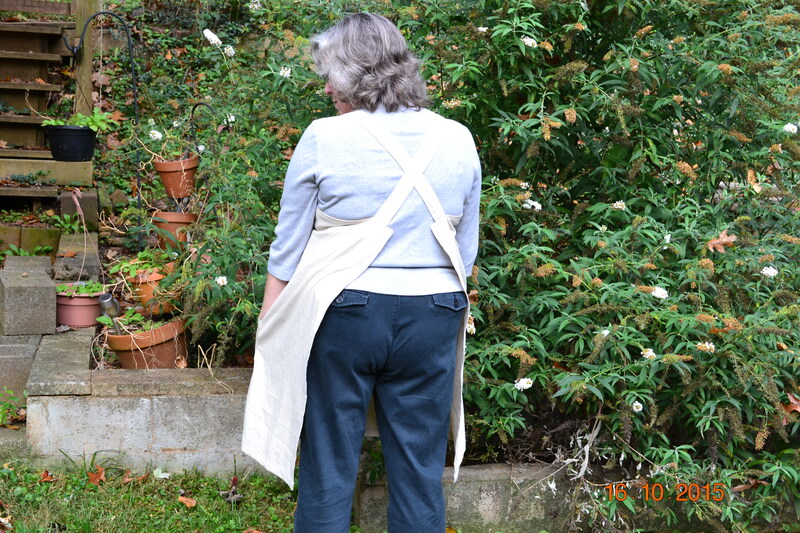 So when I saw this simple style apron (called a pinafore from Rough Linen) I was really drawn to it. Then I started thinking about aprons in general. Aprons are so cute. And functional. I have made many in my day. In fact I believe it was a first project taught in home economics class. This is where we learned to square up the fabric and cut out a rectangle for an half apron attached to a waist tie. I’ve embellished aprons with my embroidery machine. I’ve sewn a few from patterns. Cute! Cute!! And you may remember my post from last year. But….I don’t wear an apron. When I am working in the kitchen either cooking or cleaning, I don’t wear an apron. And I ruin my clothes in the process. But, they drive me crazy. They don’t fit me properly. My proportions are not the same as most full aprons. So, when I saw this apron I had to try it out. I started thinking about it and I realized that in order for it to fit me well enough I would have to make it fit — well, me. So, I measured my high bust and added 4 inches to that measurement for hemming and ease. Then I measured from my high bust to just about my knee. Then I kind of measured from the top of high bust across my back to about my waist. 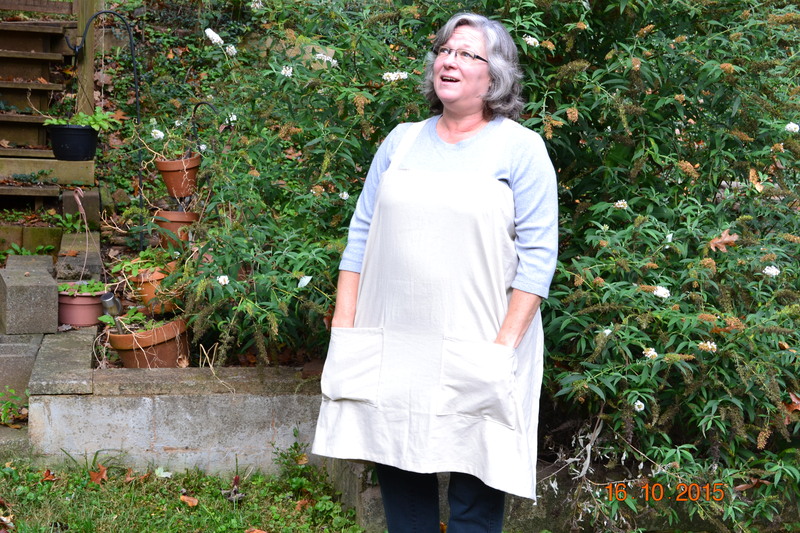 I used linen to make my apron. It’s classic, durable and I just like linen. I cut the length plus another 4 inches out of the yardage of linen that I had. I cut another strip 3 inches along that width for a facing. Cut the straps and pockets from the remainder of the fabric. Next I constructed the straps by sewing two straps together on three sides leaving one end opened and turned right side out. I pressed it and top stitched 1/8″ from edge down both long edges of the straps. I measured out 4 inches from the center at the top of the body of my apron and pinned the straps to the top lining up the raw edges. You can baste these in place or just pin. Now line up the 3 inch facing piece and pin it on top of your strap along the width of your apron. Again lining up your raw edges. The straps will be sandwiched between the right sides of the apron and facing. Stitch along the width of the top edge attaching the facing and the straps. Press facing up away from the main body and press the seam allowance toward the facing. Next turn under raw edge on both sides of the apron 1/4″ and then 1″ enclosing the raw edges of the sides and creating a hem. Stitch close to the top of the hem’s folded edge. 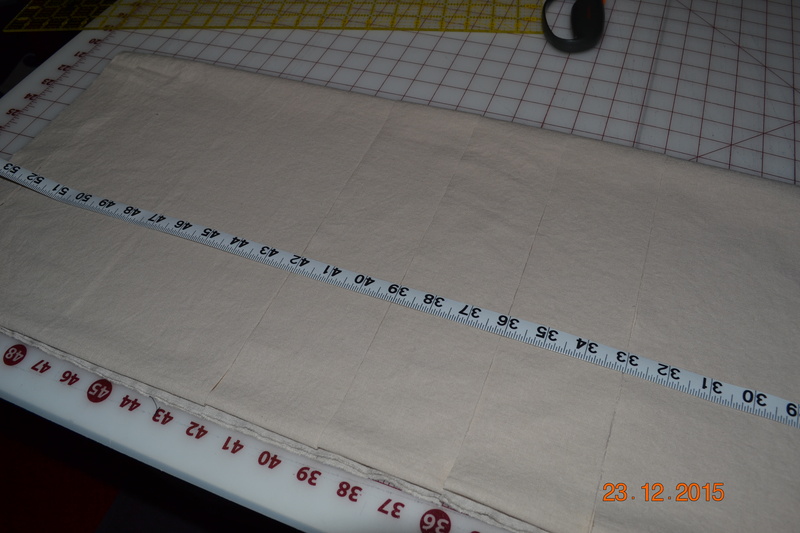 Press the facing down toward the main body and top stitch 2″ from the top of the apron to stitch down the facing. Make sure the straps are out of the way. Measure 4″ out from center (In both directions) and about 16″ down from the top of apron to determine the bottom and edge of pocket placement. Fold and press down 1/4″ of the top of 10 1/2″ and then to the wrong side 1″ and press. The right sides will be together. Stitch 1/2″ from the top to the bottom of the 1″ hem on top of pocket on each side. Trim the corner and turn it right side out. Press under 1/2″ on each side and the bottom of pocket. Place pocket lower edge at the points marked to the front of apron. Stitch close to the fold edge on three sides and double stitch at top edges or create a small triangle to secure the top of pockets. Cross the strap without twisting to the opposite back edge of apron at the top. Pin to wrong side and cross the second strap to it’s opposite edge and pin. Try apron on to determine if straps need shortening or if this length works for you. When you are happy with placement stitch in place sewing a box with and “X” in the center for reinforcement. Turn under bottom hem 1/4″ to wrong side then turn up hem at least 1″ (or more if you prefer). Stitch close to top fold edge of hem. You are done. I hope that these directions make some sort of sense. 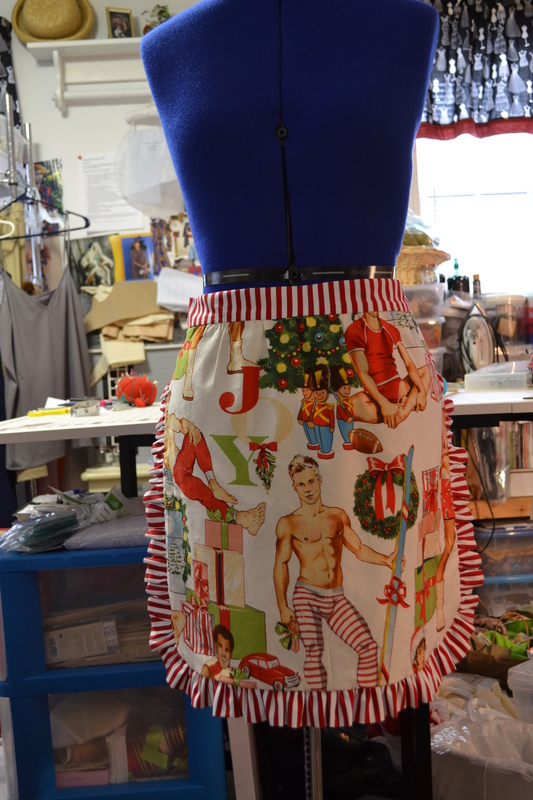 It really is an easy apron to make. I plan to make more of these. My sister requested a way to hang a towel to her apron so I replaced the right pocket with a loop for her to thread her towel through. 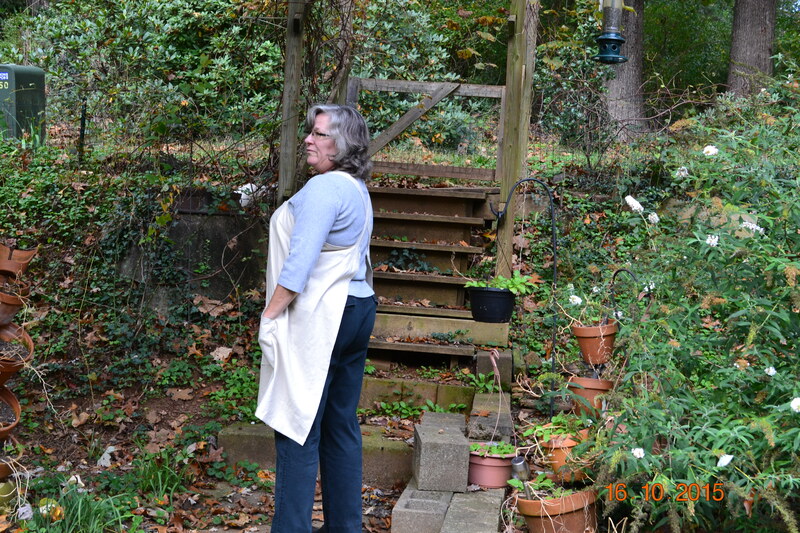 This entry was posted in Sewing, Uncategorized and tagged Aprons, linen, simple style. Bookmark the permalink. Excellent! That will keep your clothes clean 🙂 I’m six foot tall and our shop bought aprons are both too long for me, so goodness know who they make them for! Lovely! Looks like you’ve cracked this one, not only for yourself, but for others, too! (I also remember aprons as the first home ec sewing project.) Well done, you! That looks a lot comfier than ones than hang over your neck, those drive me a bit mad as I end up with too much in my pockets and they pull down.